VALENCIA: (DNA) – Spain held off a battling Norway to open their Euro 2020 qualifying campaign with a 2-1 win on Saturday in Valencia. Luis Enrique’s side controlled play with quick accurate passing and claimed the three points with goals from Rodrigo and Sergio Ramos. Norway forward Joshua King converted a penalty between both efforts for the home side. “You have to assess the positives. We deserved to win 5-1 or 6-1, but football only rewards goals,” Spain coach Enrique said. Alvaro Morata wasted the best opportunity of the opening 10 minutes as his powerful header landed straight into the hands of Norway goalkeeper Rune Jarstein. The deadlock was broken after 16 minutes as Valencia forward Rodrigo bagged his fifth goal in 16 international appearances. The 28-year-old finished smoothly after Jordi Alba’s cross from the byline. On the half-hour mark the visitors should have equalised. Martin Odegaard broke down the right flank and drilled a pass across the face of the goal beating David de Gea. But Tarik Elyounoussi’s strike went wide with the empty goal in front of him. The ball was in the Norwegian net for a second time 10 minutes later. Real Madrid’s Marco Asensio found Alba alone in the box who beat Jarstein, but he looked across the pitch and saw the linesman’s flag raised for offside. Dani Ceballos went close seconds before the half-time whistle, but his shot from the penalty spot was blocked by left-back Haitam Aleesami. Elyounoussi’s luck failed to improve in the second half. The AIK attacker was harshly booked on 50 minutes after mistiming a challenge which only slightly caught Ceballos on his foot. The teams were level with 25 minutes remaining with the first penalty of the game. Inigo Martinez was adjudged to have felled Norwegian skipper Stefan Johansen. King slotted home from the spot but the visitors’ joy was short-lived. 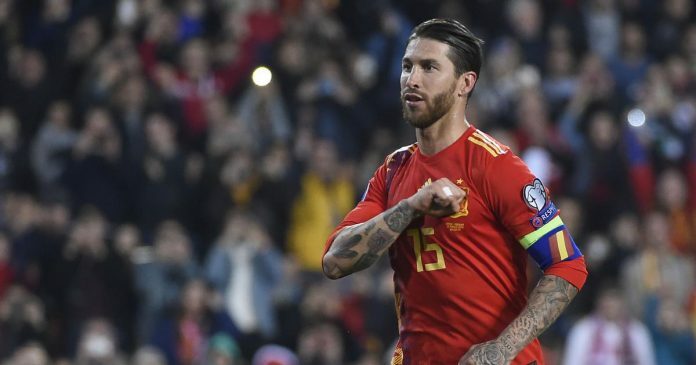 Six minutes later Morata was brought down in the box by keeper Jarstein and Sergio Ramos restored the Spaniards’ advantage by chipping his effort over a diving Jarstein. Enrique’s side head to Malta on Tuesday in their second game in the group and Norway host Scandinavian rivals Sweden.